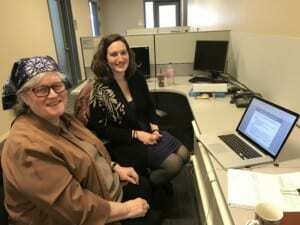 Vivian Lyons, an epidemiology PhD candidate at the University of Washington, visited CACTI Global Network Director and CTI founder Sally Conover, MPH at CUNY Hunter’s Silberman School of Social Work campus on Tuesday, January 30th to take part in a fidelity review training. Ms. Lyons and her team were previously profiled on this site; they are leading an intervention for patients with firearm-related injuries at Harborview Medical Center in Washington called Helping Individuals with Firearm Injuries (HiFi) and are adapting the CTI model in their work to provide supportive case management to patients as they are discharged from hospital care. Ms. Lyons directs the fidelity evaluation for HiFi. During her daylong visit, she and Ms. Conover reviewed best practices for fidelity review of CTI and brainstormed about future adaptions to the review process.